What a privilege to have known Pat Pilkington. We first met at Parliament at the launch of Penny Brohn Cancer Care’s national Living Well program. There were many people at the event, from the Cancer Centre, other charities, the NHS, Government, celebrity and others, like me. Pat made an impression not only because she looked amazing, as I later learnt she always did, but she spoke so warmly to everyone. I returned to the Penny Brohn Cancer Centre for a Living Well retreat. Pat, voluntarily, spent an evening with clients as part of the longer retreats and I once again was blessed to be in her company. My retreat group sat comfortably in a lounge and listened, captivated by her stories. She told us about the beginnings of the Centre, the inspiration, passion and belief. Stories of her friendship with Penny Brohn. Her love for her husband, Christopher and how she missed him since his passing. Of her spirituality and beliefs. She asked questions of us and listened to our answers. She embraced all of us, our loves, lives and concerns. Pat gave each of us her email address and invited us to correspond with her. After a warm hug for all who wanted it, we headed up to our beds feeling an incredible sense of support, love and overwhelming admiration. 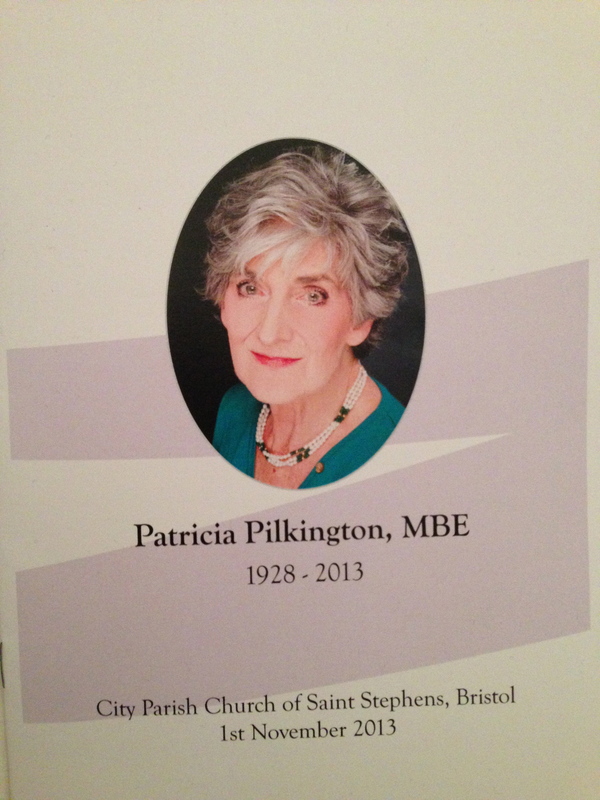 Today was Pat Pilkington’s Memorial Service in Bristol. She passed away in August after being diagnosed with terminal cancer a few months ago. I felt strongly that I’d like to attend to pay my respects to an incredible and inspirational lady who made a great impression upon me. What a beautiful service, well planned with well chosen readings, music and words – wonderfully uplifting and which I felt reflected Pat perfectly. Pat leaves a legacy of warmth and care within the Penny Brohn Cancer Centre that I’m sure will continue to be felt by clients attending the Centre. Pat has now joined her husband Christopher, the love of her life. This entry was posted in Living, Support and tagged Penny Brohn by AnnaGoAnna. Bookmark the permalink.